Emergency medical teams (EMTs) frequently provide surgical care after sudden-onset disasters (SODs) in low- and middle-income countries. The purpose of this review is to describe the types of surgical procedures performed by EMTs with general surgical capability in order to aid the recruitment and training of surgeons for these teams. A search of electronic databases (PubMed, MEDLINE, and EMBASE) was carried out to identify articles published between 1990 and 2018 that describe the type of surgical procedures performed by EMTs in the impact and post-impact phases of a SOD. Further relevant articles were obtained by hand searching reference lists. A total of 16 articles met the inclusion criteria. Articles reporting on EMTs from a number of different countries and responding to a variety of SODs were included. 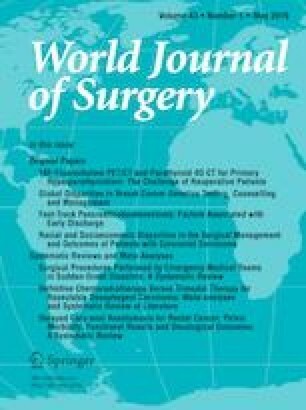 There was a high prevalence of procedures for extremity soft tissue injuries (46.8%) and fractures (28.3%), although a number of abdominal and genitourinary/obstetric procedures were also reported. Based upon this review, deployment of surgeons or teams with experience in the management of soft tissue wounds, orthopaedic trauma, abdominal surgery, and obstetrics is recommended. The online version of this article ( https://doi.org/10.1007/s00268-019-04915-1) contains supplementary material, which is available to authorized users.